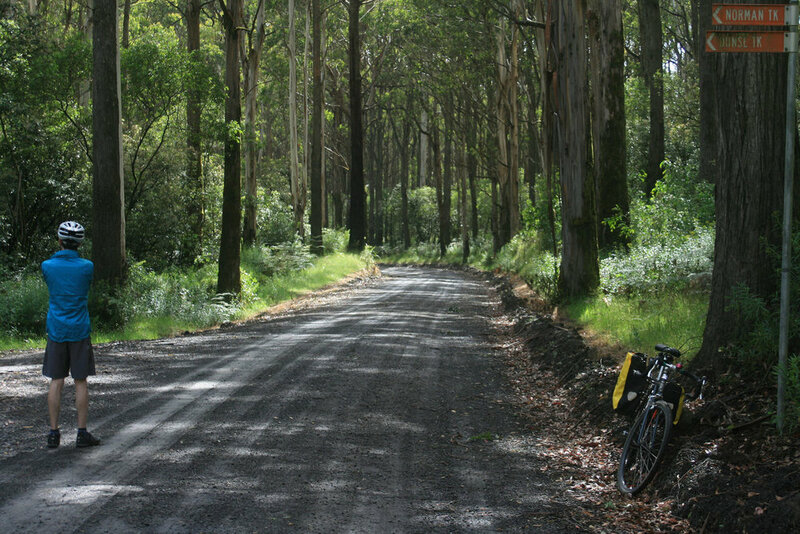 This ride takes in the lush farmland and temperate rainforest of the Otways, with a visit to the coastal town of Lorne. It's roughly a third each of sealed, well-made gravel and rail-trail, and while not high mileage, it's very hilly, with two major climbs, two great descents and a lot of undulations in between. 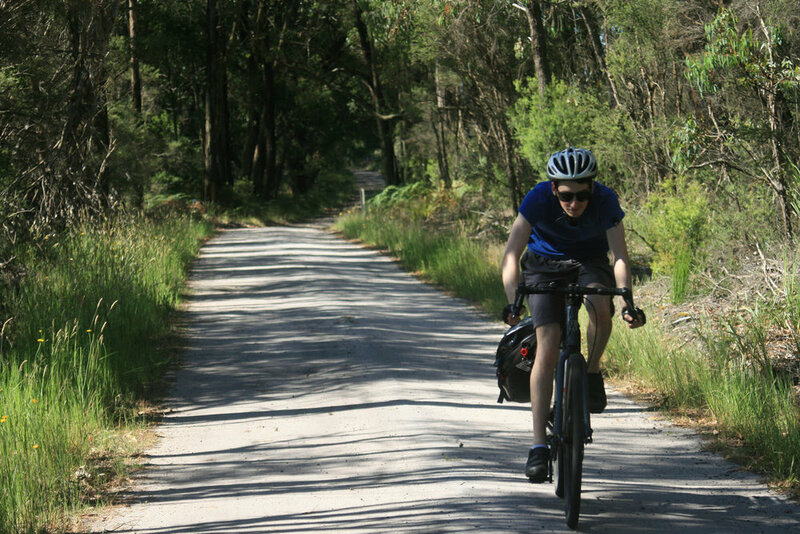 The first third of the ride is on the main road between Birregurra and Lorne, and although there will be some traffic, outside of peak tourist times it shouldn't be too heavy. It is on this section you will encounter the first major climb and descent. This ascent isn't severe, but the downhill into Lorne is long, windy and fun. The hardest climb comes after Lorne on Erskine Falls Road. This one is reasonably big and pretty steep in parts. This takes you onto Mt Sabine road, an undulating gravel road with very little traffic that more-or-less follows the spine of the ranges. 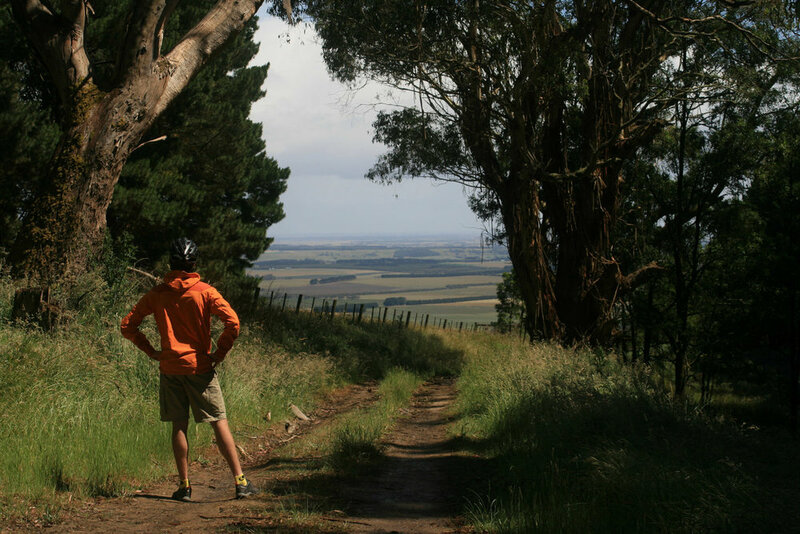 After about 25km you will reach Forrest-Apollo Bay Road where you will turn left, and after a few kilometres turn right onto Turtons Track, a single-lane sealed road, again with little traffic. 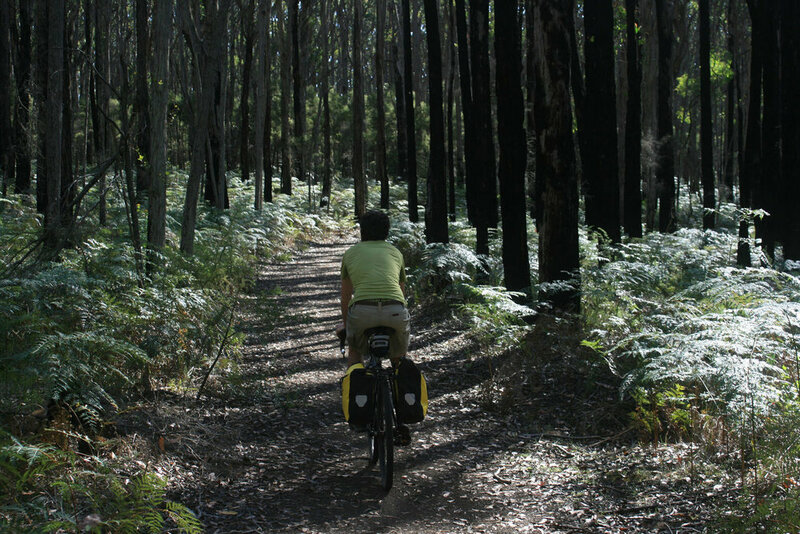 Turtons Track is one of the prettiest stretches of bitumen I have cycled, a narrow ribbon of black-top that winds through an area of tall, wet eucalypt forest. Eventually it widens and takes you to the hamlet of Beech Forest, from where you will join the Old Beechy Rail Trail for the remainder of the journey to Colac. The start of the trail is well marked on the right-hand side of the road, shortly after the Beechy Hotel. The Old Beechy has some steep and gravelly sections early on, but soon settles into a more relaxed mood with a long, gradual, winding descent into Gellibrand. It's a very charming trail, a narrow-gauge line that, again, takes you through very beautiful forest. The region itself is a world famous attraction thanks to its wild and scenic coastline, beautiful beaches and the stunning rainforest that carpet its ranges. 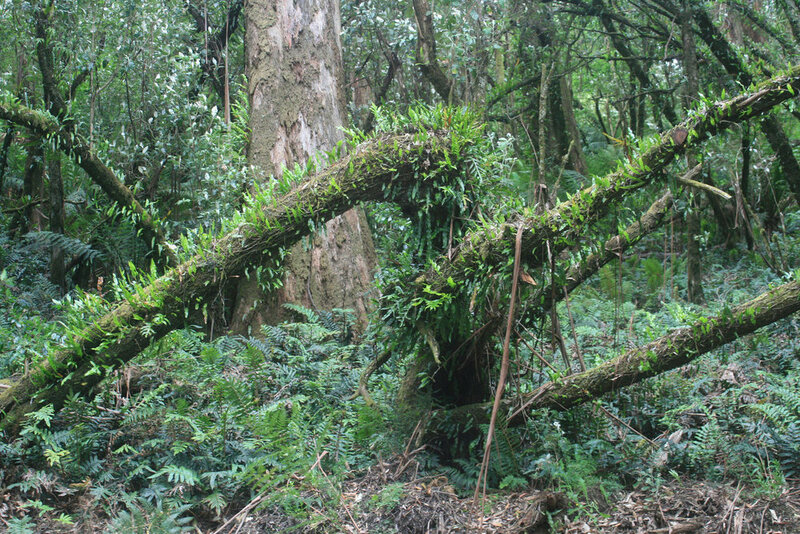 The forest is lush, containing tree ferns and mountain ash, the tallest flowering plant in the world. There are three waterfalls (all marked on map): Erskine Falls, Sabine Falls, and Beauchamp Falls, where you can also camp. You can swim at the beach in Lorne, and check out the things to see and do in town. Culinary attractions include wineries, breweries, berry farms, cafes and restaurants. Take a look at the Otway Harvest Trail for more info. 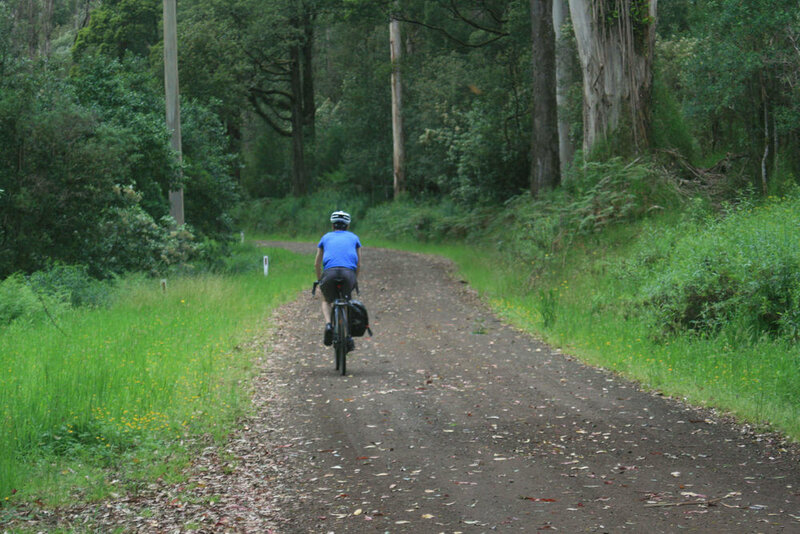 Interesting settlement and logging history, particularly along the Old Beechy Rail Trail. During peak tourist season (from about Christmas until the end of January) and public holidays, the whole region is pretty busy. Not to say that you can’t enjoy yourself, but there will be more traffic on the roads and camping/accommodation will be harder to find. Outside of these times it’s much quieter. Be prepared for windy, cold and wet weather at any time of year. It’s one of the cooler, wetter parts of Victoria. Be aware of bushfire risk during the warmer months. Check the Vic Emergency site for current warnings, or download the app. Both the start and end point of this ride are on the Warrnambool train line. V-line runs three services a day in both directions on this line. Remember to check for service disruptions. Read more about using the train network with your bike. Towards the bottom of this page are links to guides/maps of different parts of Otway National Park. They cover various parts of the ride on more detail (all free).